Spring Fellowship Brunch & Workshops with special guest speaker, Susan Meissner. Saturday, April 30, 2016 at The Cove in Rancho Bernardo. Only $20. Register today! 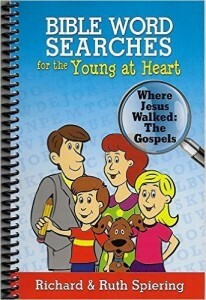 We’ve self published our latest book, Bible Word Search for the Young at Heart – Where Jesus Walked (The Gospels). It is a more story-like and perhaps for a bit older readership than our first three books published by Harvest House. Number 3, Amazing Bible Word Searches for Kids, is still in print. 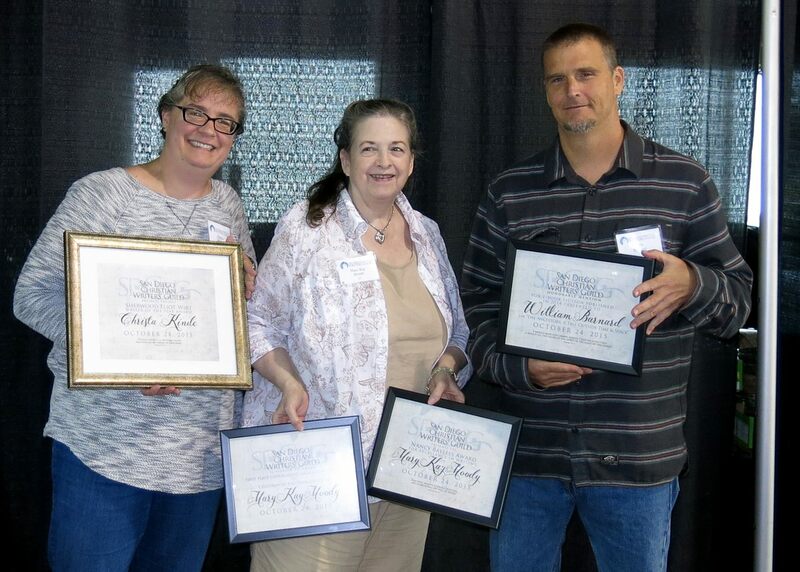 Congratulations to the SDCWG Writing Award Winners for work published in 2014. Awards were presented at the SDCWG Fall Writing for Life conference in Rancho Bernardo (Maranatha Chapel) on October 24. Remember: Only three will be chosen for critiquing. As D.C. Jacobson & Associates Literary Agency’s first marketing coordinator, Laurel Boruck works with authors and publishers to help get books into the hands of the readers who need them. She works with agents and authors to develop book proposals with great marketing, platform and publicity sections, and helps authors and publishers strategize on marketing plans. Before joining DCJA, Laurel was a project manager and marketing manager at Ooligan Press. Laurel holds a BA in English from the University of Oregon and an MA in Writing and Book Publishing from Portland State University, where she accidentally discovered that she was an absolute nerd when it comes to book marketing and publicity. That enthusiasm gained in the classroom was reinforced by marketing internships at Harper Perennial at HarperCollins in New York, and at Portland’s own Tin House Books. 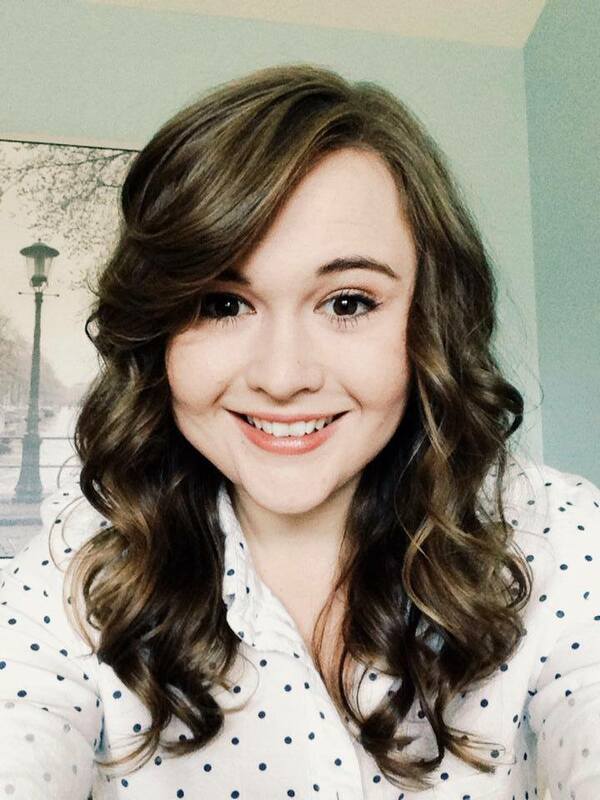 In her free time, Laurel enjoys playing pub trivia with friends and drinking strong coffee with a good book in hand. Consultation signups with Laurel require an approved one-sheet. * Watch our web site for the latest faculty information. 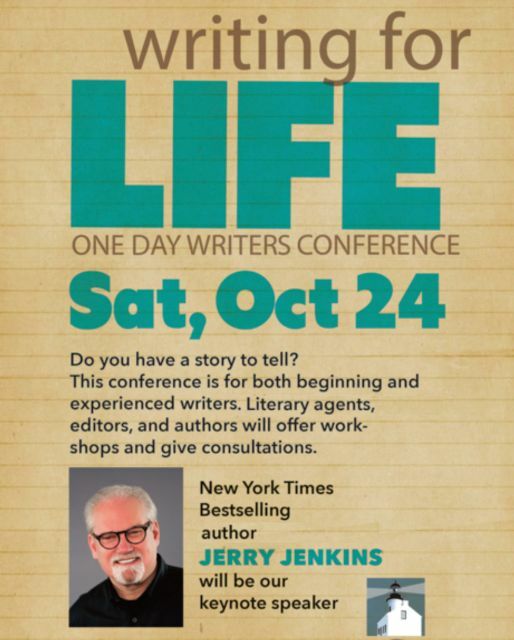 The all day Saturday conference is designed to instruct, inspire and let you meet the writers, editors, and publishers who are committed to helping you write, get published and follow the Lord’s call on your life. We’re here to help you use your gifts. Last day to receive the Early Bird discount is September 30. Register today! You can register online via Paypal or print and mail in your registration form. Do it today! Please help spread the word about the conference. Here is a flyer you can print and post on bulletin boards, tweet, promote on Facebook, or just hand out to friends. Or, submit this short blurb to your church bulletin. Thanks in advance! 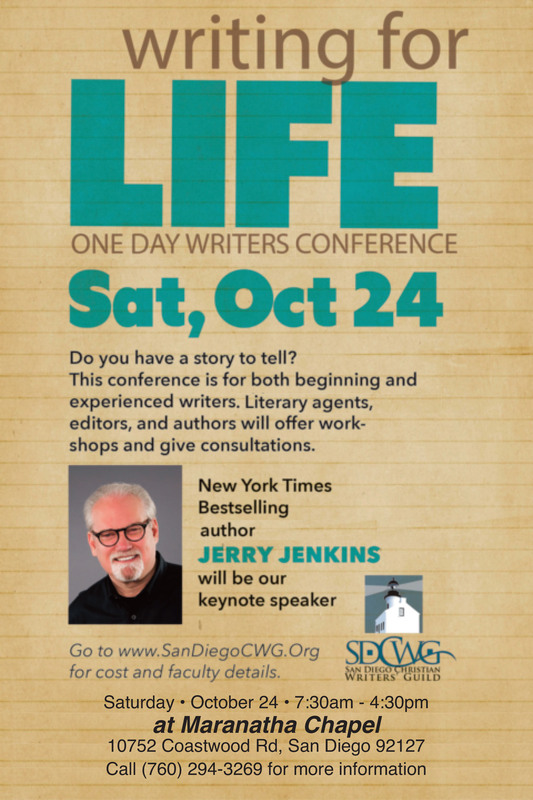 Bulletin Blurb: San Diego Christian Writers Guild Conference: Saturday, Oct 24, 2015. 7:30am-4:30pm at Maranatha Chapel in Rancho Bernardo. 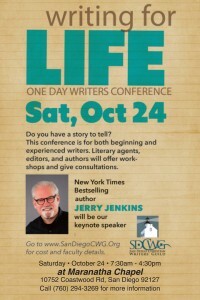 Keynote speaker NY Times bestselling author JERRY JENKINS. Do you have a story to tell? This conference is for both beginning and experienced writers. Literary agents, editors, and authors will offer workshops and private consultations. See web site for details: www.SanDiegoCWG.org or 760.239.3269. Early bird discount available if registered before 10/1. The book table is available to faculty and SDCWG members who attend the Fall Conference. Please read our guidelines and submit your Book Seller Form via email by Wed., Oct. 24. All books must be picked up no later than 4:30pm. Check our web page for the latest on schedule and workshop information. The conference hotel is the Rancho Bernardo Radisson. It is located at 11520 W. Bernardo Court, San Diego California 92127. All rooms are suites. Please ask for the special rate for those attending the San Diego Christian Writers Guild conference. Note: This is not the location of the conference. The conference is a short, five minute drive from the hotel. 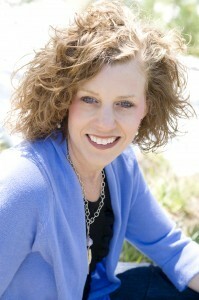 Tawny Johnson is a literary agent with D.C. Jacobson & Associaes. 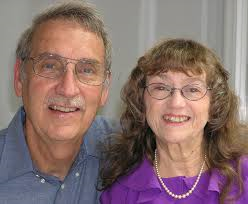 She has been associated with the Christian retail and publishing industry since 1979. Her years of experience in bookstore retailing give her the unique ability to recognize relevance and marketability. During her time at Multnomah Press, Tawny was the marketing and advertising manager. She was also instrumental in developing the company’s Foreign Rights division by promoting authors to foreign publishers at the International Book Fair in Frankfurt, Germany. 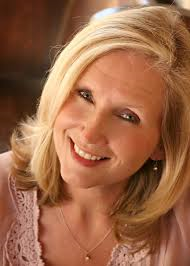 Tawny holds a bachelor’s degree in Bible and Theology with a minor in English Literature from Multnomah University and a master’s degree in Theological Studies from Multnomah Biblical Seminary. Blythe Daniel: Literary Agent. As president of The Blythe Daniel Agency, Inc., Blythe works with clients in the areas of her 20 years of experience: book development, literary representation, and marketing. She executes publicity campaigns, and as a literary agent she helps to develop an author’s unique, compelling message and secures publishing contracts for clients.As an agent, she represents mainly inspirational, home, and lifestyle books from authors who come from organizations like Focus on the Family, FamilyTalk, Cru, Proverbs 31 Ministries, Dollar General, JP Morgan Chase, Houston Chronicle, and others.She has booked authors on thousands of media outlets, including The Today Show, Good Morning America, Fox News, CNN.com, Ladies Home Journal, The G. Gordon Liddy Show, The 700 Club, Moody Radio Network, FamilyLife, Focus on the Family, USA Radio, LA Daily News, and others. In response to your requests to keep ticket prices down, we’ve organized our conference into one great day. Join us on Sat., October 24 for a day of motivation, networking, and learning. Guild members who register before Oct. 1 receive a $20 early bird discount. Check the guidelines on our web site and submit your writing for a once-in-a-lifetime chance to receive feedback from a NY Times bestselling author. Deadline is Oct. 10 so don’t delay!